Ivan Brandon is credited specifically with the script, which frankly I found downright awful. There's something to be said for grounding a series in a specific era via appropriate verbiage, but there should also be an unspoken rule that if the reader can't follow it, you're doing something wrong. From all indications these Norse creatures are speaking English, but the meat of their message is lost amidst this desire to sound authentic. What's worse, on the few occasions I did get the jist of what was being said, it was never anything particularly important. These guys wax philosophical about the most mundane details and address each other like strangers, even if they're blood relatives. The lack of a credited writer leads me to believe Brandon is also responsible for the plot, which sadly fares no better. Viking leaps from one scene to the next like the Hulk from curbside to canyon, sometimes even departing mid-sentence. If anything made sense in the first place I'd call it confusing, but that would insinuate a certain level of initial awareness that simply isn't present. The subject matter is like a dream – one minute we're sharing a casual meal with a cabin of shipmates, then scarcely three panels later all but one have literally lost their heads. An old man fishes for eels using the severed, rotting head of a horse as bait. When he finds success, the whole scene is treated nonchalantly, like this kind of thing should be common knowledge. The whole issue is like that: one surreal, excessively macabre scene after the next. It makes a few genuinely interesting observations, but they each seem to involve something taking a spear through its side. Nic Klein's artwork is the issue's greatest asset, and even it has moments of weakness. Klein amps up the strangeness presented by the story with an odd blend of paint and ink. His efforts shift suddenly and unexpectedly from a more traditional, sharp mixture of strict black linework and computer-aided coloring techniques to the softer, more neurotic direction of his paintings. The switch occurs several times a page, and sometimes more than once within a single panel. That results in compositions that often blend together into one giant, colorful, illegible blob. His style flails about with equal inconsistency, never deciding whether it would like to deal in harsh realism or exaggerated, over-the-top caricature. If he could stick to one or the other, there's plenty of evidence he could be producing some great work, but his indecision is costly. 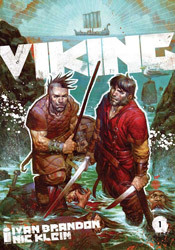 Viking is one big mess, a collection of clashing styles and incompatible influences both in its writing and its artwork. I can't fault it for lacking originality, nor for taking any risks in a medium that's always looking for something a little bit different. Its intentions were pure, its collaborators more than willing to take a few chances, but such efforts don't always result in great rewards. This issue showcases a number of characters with great promise, but I just couldn't connect with any of them. I found this to be bewildering, frustrating and unrewarding – a fine concept that was lost somewhere before its execution. Skip it.